We’ve suspected that “worker centers” leading the walkouts of fast food restaurants and big-box retailers are union front groups, and evidence continues to pour in that not only are unions bankrolling the campaign, but unions are also deeply involved in strategy, organizing, and tactics. 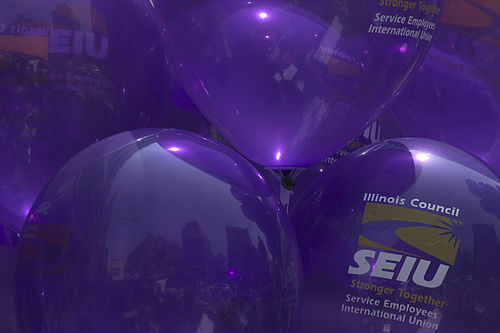 Two new items of evidence have come out in the past few weeks that show the Service Employees International Union (SEIU) is the force behind fast food worker walkouts and that these protests are anything but grassroots. First are legal filings that the “Workers Committees” that are the embryonic labor unions supposedly leading the protests made with the Department of Labor. (Perhaps the possibility that the groups would be reclassified by courts as “labor organizations” spooked organizers into voluntary compliance with the law.) On the Forms LM-1 that unions are required to file with DoL when they are established, the new labor organizations must list their interim leadership. Five of these proto-unions’ Forms LM-1 are linked below, along with their presidents’ job titles as reported on various SEIU Forms LM-2 for 2012. Meanwhile, the author’s sources suggest SEIU’s end-game involves a three-stage strategy that will end in unionization of the fast food industry. First, SEIU hopes to use the national “momentum” from the protests it is stage-managing to contest the legal distinction between brands and franchisees. (Typical fast food restaurants are owned and operated by small businesses independent of the national companies that provide supplies and rent their brand names.) Second, the SEIU will conduct “research” claiming widespread violation of labor laws to get the courts to rule in its favor (or the Administration to do it a favor). Finally, the SEIU will pressure the now-unified industry to agree to card-check unionization, stripping workers of their right to vote in private on whether to join SEIU. It’s an audacious plan, but SEIU has staked millions on the battle. SEIU’s identified front groups received over $7 million in 2012 alone, and the In These Times report notes that one of SEIU’s main political consulting firms, BerlinRosen, has seen its retainer triple from 2010 to 2012. If employee rights stand in the way of SEIU’s millions, then expect SEIU to use every trick in the book to shove them aside.